The world exploded in media fuelled hyperbole on November 4th when Senator Barack Obama became the 44th President elect of the United States. How a black man (actually he’s half white) finally got to the most powerful position in the world became fodder for myth-making and over-the-top expectations. But what got lost in the frenzy, as often happens in cult-building, are the details. Understand the opportunity and the need: In 2004, George Bush defeated John Kerry by harping on the theme of national security. Kerry helped by being a less than inspiring leader. By 2006, the mood in the US and around the world had changed. The war in Iraq was becoming more unpopular by the day, the shifting positions of the establishment on the war against terror and the worsening state of the economy started shifting popular opinion against the incumbent. Obama quickly grasped the unpopular mood and realized that there was huge momentum building against the policies of the government. He then went to work. Focus: He kept the focus first, on the deteriorating state of the economy secondly, on the unpopular wars. His message didn’t change right till the end. Broad-based, articulate, and calm Messaging: He came across as a thoughtful and articulate person who appealed to and energized a wide cross-section of voters. His personality and demeanour was calm and composed. He didn’t get upset or rattled. Target Audience: Obama understood that the demographics of the US was changing with more secular, younger and multi-ethnic voters than ever before. He had to get access to this large group and then get this group to act cutting across political affiliations. His campaign had people physically reaching out to people, verifying their eligibility and making sure that they came out to vote. 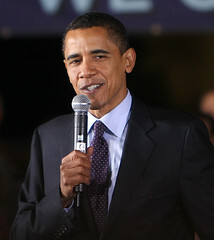 Funding: Obama raised over $700m for his campaign. Most of the money came from millions of people around the US making small donations. Technology was extensively used with his web-site allowing people to make contributions. Team of Advisors, advocates and personal background: Realising that he needed to get top class advice on various policy matters, he built up a formidable array of experts and advocates. From Google’s Eric Schmidt to Lawrence Summers (former Harvard President, US Treasury Secretary and Chief Economist of the World Bank) and to legendary billionaire investor Warren Buffet to talk-show queen Oprah Winfrey (who it is said contributed to at least 1 million votes) to people from the entertainment world. He himself is from Columbia University and Harvard Law School. Relentless execution: Over the past 2.5 years, Obama and his campaign team have relentlessly executed their game plan, travelling the length and breadth of the country including to the opposition strongholds and were almost flawless. Every detail was thought of and actions were swift. “Luck”: is what happens when opportunity meets preparation. As the banking system, the home markets, the economy and finally people’s confidence started crumbling Obama was prepared. Bush’s 25% approval rating reflected the mood of the country for the past 2 years ever since Obama began his campaign. He was prepared to act and move when the opportunity arose. His opponent was still harping on the tired themes of 2004 when the battle was for 2008 and beyond. By the time, John McCain too started reacting to the terrible situation all around it was perhaps too late. India’s has the world’s largest population of youngsters i.e. below the age of 35 estimated at about 500m+. Do our leaders represent the hopes and aspirations of this group? India needs several Obamas!